ECB’s meeting is behind us, while the gathering of the Fed officials is ahead of us. In the meantime, the price of gold jumped above $1,300. Will it stay for longer? the incoming information has continued to be weaker than expected on account of softer external demand and some country and sector-specific factors. The risks surrounding the euro area growth outlook have moved to the downside on account of the persistence of uncertainties related to geopolitical factors and the threat of protectionism, vulnerabilities in emerging markets and financial market volatility. The slowdown in Eurozone’s economic growth pushed markets to scale back their expectations of the first interest rate hike – they are pricing in an upward move only in mid-2020, well after the summer of 2019 and the end of Draghi’s term in October. That’s rather headwind for the euro and the price of gold. However, investors may be too pessimistic. After all, we experience a slowdown, not a downturn or the beginning of a recession. Some of the current downside risks may wane. For example, the specific episode of the car industry in Germany, which contributed to a slowdown in the biggest Eurozone’s economy, will soon wash out – and we will see a rebound in the sector. Or, the trade dispute between China and the US may wane, as the slowdown in the former country will force the Chinese government to make some concessions. Moreover, as Draghi pointed out, “financing conditions continued to be basically very favourable.” The latest monetary statistics also defies gloom. Indeed, household lending held steady at post-crisis high of 3.3 percent, while the annual growth rate of broad monetary aggregate M3 increased to 4.1 percent in December 2018 from 3.7 percent in November. It was above expectations and it was the best M3 reading since last June. As broad money supply often foreshadows future activity, the case of euro may be not lost. It should provide an additional support for the gold prices. How did the EUR/USD exchange rate reacted? 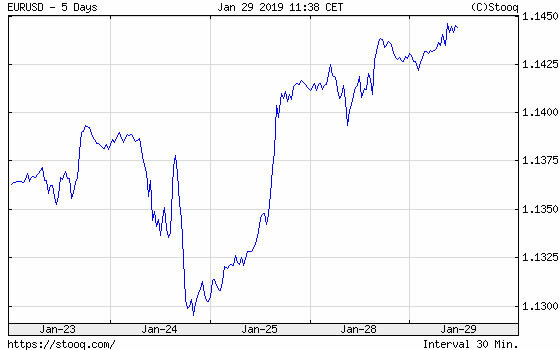 Actually, after an initial decline, it rebounded over the weekend, as the chart below shows. Chart 1: EUR/USD exchange rate over the last five years. The royal metal has performed even better. As one can see in the chart below, the price of gold has recently jumped above $1,300. Chart 2: Gold prices (London P.M. Fix) in January 2019. Interestingly, the US government reopened fully on Monday. However, it did not prevented gold from continuing its rally. It seems that concerns about slowdown in China and uncertainty about the Fed’s stance support gold prices right now. Tomorrow, the newest FOMC’s statement on monetary policy will be published. 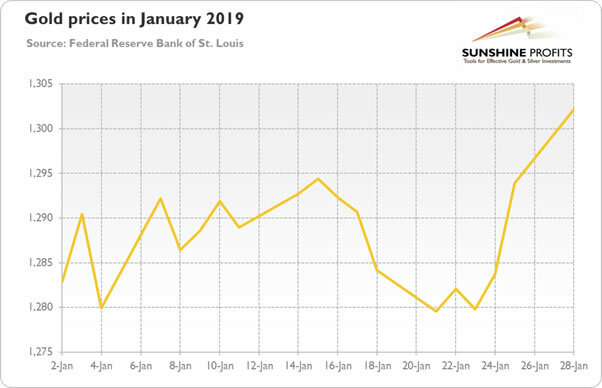 The U.S. central bank is expected to leave interest rates unchanged, but it might provide valuable hints about its plans, in particular how long the pause in hiking might be. The markets expect that Powell will be rather dovish. But it does not have to be the case. Actually, the only reason behind the recent dovish signal was the December slide in the stock market. But the S&P 500 and other indices rebounded in January, as the chart below shows. So, gold bulls should not celebrate yet. And, as a reminder, we often see “buy the rumor, sell the fact” pattern in the gold market around the FOMC meetings. Chart 3: S&P 500 Index over the last twelve months. Importantly, the publication will be accompanied by Powell’s press conference, as now (since January 2019) the Fed Chair will hold press conference after every policy meeting. It implies two things. The first one is greater transparency. The second one is that now every policy meeting is “live”. The hike is outside the table, but markets could be volatile after the meeting anyway. On Thursday, we will cover the FOMC meeting – and its implications for the gold market. Stay tuned!